A delivery ceremony for the main part of the construction project of a combat-readiness highway for the Ganbala radar station of the Air Force of the Chinese People’s Liberation Army (PLA) was held on the morning of November 21, 2012. The Ganbala radar station is the highest man-controlled radar station in the world with a height of 5,374 meters above the sea level. 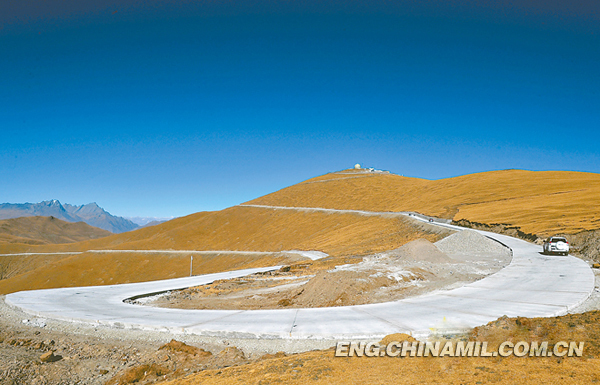 The project of the highway, measuring 9 kilometers in length, was undertaken by the Office of Traffic and Combat Readiness of the Tibet Autonomous Region and the Military Transportation Department under the Logistics Department of the PLA Air Force. After nearly 15 months of construction since September of 2011, the completed combat-readiness highway, featured with standard and scientific designs in protection and drainage systems, costs over 29 million yuan. Prior to the construction, the highway was a winding sand road which, in frequent rains and snows, witnessed landslides and debris flows from time to time. Being only 9 kilometers in length, it used to take nearly an hour of drive, but now, it takes less than 15 minutes. According to leaders from the Military Transportation Department of the Logistics Department of the PLA Air Force, all the radar stations on the snowy plateau will have the class-4 highways built according to national standards under the joint efforts of military and civilian sectors. It is offical, Y-20 it is. Two more Jianghu FFGs are done for.